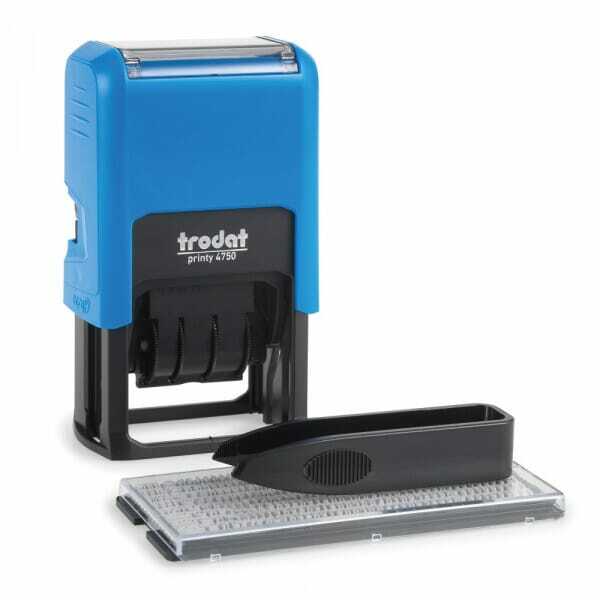 Personalise and create your own D-I-Y self-inking rubber stamp with the Trodat Typomatic. The 4750 allows you to create your own messages quickly and easily. Each kit contains a self-inking stamp, a selection of different characters, tweezers for setting your message and a replacement pad. All characters are reusable, so can be used over and over creating new impressions each time. The stamp creates an impression of 41 x 24 mm and can accommodate up to 2 lines of customised text. Along with a built in date band within the stamp, the band creates an impression of date, month and 12 consecutive years. Your personalised wording is made with blue ink, whereas the date is using red ink. Customer evaluation for "Trodat Typomatic Printy 4750 - 2 lines of text + 4 mm date"